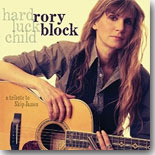 Rory Block continues in her series of tributes to legendary bluesmen, with Hard Luck Child covering the music of Skip James. It's our Pick Hit for the month. Our Surprise pick for the month introduces some very talented teens from Indiana --- The Sad Sam Blues Jam --- with their first release, Finally .... the EP. Delmark Records is releasing Junior Wells' excellent early '70s album Southside Blues Jam, with extra cuts included. It's this month's Flashback feature. Our What's New section features reviews of new CDs from Daddy Mack Blues Band, Candi Staton, Billy Boy Arnold, Bruce Katz Band, Howard and the White Boys, Nathan James, George Taylor, Georgie Bonds, Altered Five Blues Band, HowellDevine, Lisa Mills, and more. All contents Copyright © 2014, Blue Night Productions. All rights reserved.